Designed to handle everything from pummeling rock to single-coil twang, the Player Telecaster HH carries its pure Fender pedigree with pride. Loaded with Alnico II Player Series humbuckers with coil-taps for great single-coil sounds, you can't beat the versatility. The 22-fret maple on maple neck is smoothly playable, with easy bending, thanks to the contemporary 9.5" fingerboard radius. 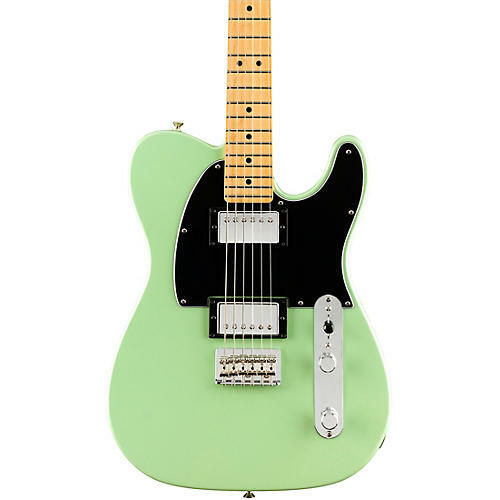 Flexible enough for any genre, with a Tele's legendary durability and consistency, this is a go-to guitar for any musical vision. For guitarists everywhere who appreciate great style, rich and versatile tone, and excellent value, the Player Telecaster HH is an elegant and affordable classic with a great combination of traditional design and contemporary features. Time-honored Fender style and performance-minded modern upgrades don't have to break the bank, and this model delivers the best of both in an instrument ideal for Telecaster players everywhere at every level. This model comes in a limited edition Daphne Blue or Surf Pearl finish. Case sold separately.